That Sinking (population) Feeling . . . The Sentinel reports that the latest census estimates are in -- and Oneida County continues to lose population. Utica lost 1,569 people since year 2000, or about 2.6% of its population, leaving 59,082 remaining. Rome lost 730, or about 2.1%, leaving 34,220 behind. The county as a whole lost 1,515 people, to stand at 233,954. Actually we may not be so bad - or is this just a case of misery loving company? The Post Standard reports that Syracuse dropped 5,777, or about 4% of its population, leaving 140,658. Per the Buffalo News, Buffalo lost a whopping 16,500 people, or 5.7%, since 2000. It's population is now only 276,059. (Remember when it had 586,000 people back in the 1960s? It is now less that half of what it was.) Niagara Falls, which used to run neck and neck with Utica in population, lost 5.9%, to stand at 52,326. These are all huge losses, and they continue a trend that has lasted more than a generation. They reflect serious flaws in State policies over the last 30 years. Yet in Oneida County -- and in the other areas as well --the public infrastructure continues to expand into undeveloped land: a new school for BOCES, a new school wing in New Hartford, proposals to extend water lines further and further away from urban centers -- and now leaders are even talking about developing the area around the Westmoreland Thruway interchange. Government also continues to expand, cloning itself. The water and the solid waste authorities come immediately to mind, requiring their own employees where some were formerly shared with their prior "owners" (the City and the County). One has to ask WHY? Why do we need more "things," and why do we need more government layers, when our population is dwindling. We also must ask HOW WILL WE PAY FOR THIS? I prefer dealing with issues rather than personalities, but personalities are becoming the issue in Albany these days. The apparent war between Senator Bruno and Governor Spitzer, the latest of which was covered in the Times Union yesterday, is bringing changes in state government to a halt. Spitzer is mad because the Senate has gone on vacation leaving a boatload of unfinished work behind. "Spitzer said he is particularly upset that Bruno's conference is disregarding 53 nominees that need to be confirmed to lead various state offices and agencies." While it is understandable that philosophical differences will get in the way of quick action on a legislative agenda (which is probably a good thing), there seems to be no excuse for the Senate to drag its heels on the Governor's nominations -- after all, the new governor promised changes, he needs his appointed agency heads to make the changes, and the people voted for the changes. If someone isn't a criminal and has some experience, and has the governor's confidence, what more needs to be known? The Governor will suffer the consequences of appointing incompetents, if that is what they are. The Senate, and Mr. Bruno in particular, need to understand that they are now acting contrary to the wishes of the people. Disagree and deliberate all you want on how to solve New York's problems, but make the Governor's appointments. Last week I reacted to the OD's interview with the Mohawk Valley Chamber of Commerce's new president, Mr. Elias, noting that in an effort to "regionalize," his own organization gave up its "Utica" identity while all of the Chambers in the surrounding communities insisted on maintaining their own identities -- accomplishing nothing. Here's more . O-D: What are some cooperative efforts you can be involved in with the Rome Chamber of Commerce? Elias: Well, right now, water issues. I'm getting into these things now and right now water seems to be an opportunity. The Hinckley Reservoir in Herkimer County is the water supply for much of Herkimer and Oneida counties, and there seems to be a need for water in the western part of Oneida County, so there is a terrific opportunity for us to work together to make some good things happen. The alternative is that water comes in from Onondaga County, from the western side and the thought process is that economic development will follow the waterline — there is a tremendous opportunity for us to further economic development in both Herkimer and Oneida counties by ensuring that we work together in water issues. Isn't it odd that when a question is asked about cooperation with the Rome Chamber, Mr. Elias starts to spout the Mohawk Valley Water Authority's propaganda on how wonderful it would be to share Herkimer County water with western Oneida County. We have heard nothing of the sort from the Rome Chamber. In fact, Rome is completely capable of taking care of its own needs AND Rome is willing to supply water to parts of western Oneida County as well. If Mr. Elias wants other chambers to cooperate with him, he needs to demonstrate that he knows what he is talking about. Frank Elias: Regionalization, cooperation and working with groups from outside of the area. There's often a perception of the local area not having a regional approach, not being able to work together, not having a vision. Knowing the people that are here and knowing some of the projects that we're working on, there is plenty of potential, and there is a lot going on that people are not fully aware of. We often see Utica as separate from Rome, but when people from outside the area look at our area, we stand to benefit by regionalization by saying "Utica-Rome." I mean look at the population difference between Utica and Rome separate and Utica-Rome combined. We will be viewed much more positively if we were to act regionally and portray ourselves as a cooperative regional entity. There is the catch: We are not a regional entity. We are carved up into many little municipalities that duplicate services and work in opposing directions. Municipalities lacking certain assets insist that others share what they have -- but they don't want to share their assets in return. The prime example is the water supply. The suburban areas around Utica insisted that Utica share its water -- Utica did -- but the suburban areas that used Utica water to grow their tax base refuse to share that tax base with Utica. New Hartford insisted on turning itself into the "regional" shopping district displacing Utica from that role, requiring expensive expansions in infrastructure and its police force, and wasting the infrastructure and human resources that Utica already had in place to support it. As a result, taxpayers have paid twice for the same thing . . . and we now have urban sprawl to add to the misery. As long as we remain carved up into pieces and talk of "regionalization" in the abstract, there will always be one municipality using the "regionalization" label to take advantage of another. If Mr. Elias wants to accomplish something that benefits the people of the region, he will advocate the creation of a true regional entity -- by erasure of existing municipal boundaries and merger. Giving Some Credit . . .
My readers know that there is no love lost here over Mohawk Valley EDGE ... But credit will be given when it is due. "Hurting the economy of upstate to benefit the economy of downstate is hardly an appropriate justification for DOE's proposed corridor designation." Indeed. One must question if it is even within the power of the Federal Government to sacrifice one geographic area's economy for the benefit of another. It seems to be contrary to all that our Founding Fathers stood for. Oneida County Trashes Downtown Utica . . .
... and Utica lets it happen! Regardless of what may be happening inside the building, the outside looks like a solid waste transfer station. It has looked this way for what? 5 years? 10 years? It is an eyesore and detracts from the neighborhood. Additionally, as it appeared this Saturday morning (when no one was working), waste is clearly open to the elements where it could be scattered. How about the City code? There is no apparent desire to enforce it here. Sec. 2-22-75. Construction and demolition waste. If it were you or me maintaining this abomination, codes enforcement would have been on us like flypaper. But this is the County ... the one that thinks it's OK to send Utica raw sewage ... the one that thinks its OK to send Utica's water supply out of Greater Utica to other places that have alternative supplies available. . . . with nary a whisper of an objection from City Hall. Three weeks, we read of three proposals for street closures. This time County Executive Picente is asking the City of Utica to close Park Avenue between John and Blandina Streets to create a parking lot. "I don't want this to drag on," Picente said. "This is not by any means a quick fix; it's a long-term solution for downtown." Sorry, Mr. Picente, but we residents and people who work downtown do not need a traffic study to tell us that we will be seriously inconvenienced by this proposal. That block that you want to close is heavily traveled. Saying that you will do a traffic study is an admission that you are making the proposal without knowing its impact. (This seems to be a familiar theme in both City and County Government). And not wanting it to "drag on?" Sounds like your mind is already made up. Besides, why should we trust you to know what is best for a "long term solution for downtown?" The County has demonstrated a lack of concern for Utica and its people by sending them its s*** from its overflowing sewer facilities, letting the Utica Library go to seed, trying to send its water out of the area, etc., etc. Had enough? Yes, more downtown parking is sorely needed. . . .especially around the C.O.B. And Utica has lost a parking garage at the State Office Building. The City is proposing a new parking garage. If more spaces are needed, the County should kick in and expand the City's plans . . . or, perhaps, team up with the State to build a new garage for the employees at both buildings. But placing a parking lot in the middle of the thoroughfare between Chancellor and Steuben Parks will disrupt the axis between the two. The layout as a diagonal between two small parks is something one sees in Paris or in Washington, DC. It is an example of 19th Century urban design that could be made beautiful again with landscaping. A parking lot will make it look like ... Consumer Square in New Hartford. But this is UTICA. And it CAN come back. One really has to question if our leaders are grounded in reality. Today's OD has an interview with the new president of the Mohawk Valley Chamber of Commerce, Mr. Elias. Mr. Elias (and the O-D for that matter) have been promoting a regional approach to things -- that our local jurisdictions would be much better off if they cooperated with each other. If you remember, the Mohawk Valley Chamber of Commerce was formerly the Utica Area Chamber, which changed its name to become more "regional." What did the M.V. Chamber accomplish by doing this? Rome still has its Rome Chamber, New Hartford still has its New Hartford Chamber, Marcy still has its Marcy Chamber, Herkimer County still has its H.C. Chamber -- and people down in Amsterdam and Ft. Plain are scratching their heads because they thought they were in the heart of the Mohawk Valley, but the Mohawk Valley Chamber of Commerce does not apply to them. Obviously, Rome, NH, etc. are not interested in "regionalization" and insist on keeping their own identities. Why, then, does the Utica area CC hide its identity and location behind the inaccurate name "Mohawk Valley?" The name change did nothing to promote regional cooperation. But it does create confusion. For a group that was founded to promote "Utica area" businesses, it is doing a great job -- of hiding itself. There are some questionable ideas revealed in this interview. Those will be saved for later comment. That's How Conditions are in Camelot . . .
Two years ago the plight of the people of Camelot Village was the poster child for expanding the Mohawk Valley Water Authority to western Oneida County. Now, however, The Sentinel reports that Camelot Village will be receiving water from the City of Rome to replace that from its contaminated wells. Interestingly, the Sentinel article reports that this project will require a mere 1200 feet of water main -- less than a quarter mile! So, why should Camelot Village have been used to justify MVWA's proposed 16 mile long water main? It was to manipulate public opinion --- and the opinion of state legislators --- and the opinion of state regulators --- by the powers-that-be to get what they wanted through filtering of the facts. Our officials should be sworn to tell the "whole truth" before they are believed. A very interesting story was posted yesterday on the 'Utica Sux" forum: the story of how a local entrepreneur came up with a very ingenious device -- only to get dithering from our elected and unelected officials. The upshot is that it was an opportunity lost that North Carolina has seized upon. . More of the same old same old. . . . Give it a read, and you will be angry. Utica city fathers are promoting another pedestrian plaza, this time for Oneida Square. As with the Varick Street proposal last week, the city's desire to make key locations more appealing and pedestrian-friendly is heartening. It almost seems as though the current leadership is finally -- after 7 years -- picking up on the Hanna administration's direction: make Utica look good. People will be interested in coming to Utica again if Utica shows an interest in itself. But as with the Varick proposal, the idea of closing a street must be approached conservatively. Traffic in certain directions will be blocked. Closures are unnecessary to make streets pedestrian-friendly. The long term impact of a closure has not been assessed. Whether the inconvenience of the blockage is worth the additional of square footage in pedestrian space must be carefully assessed. Before making permanent street closures, the city could attempt temporary closures for a month or two. In that manner, the public and the city leaders will have a better idea of what should be done. Bow WOW . . . and More Nonsense . . .
A couple little stories demanded attention today. Bow WOW -- New Hartford is spending $28,000 to create a "Bark Park" where dogs can run free. New Hartford resident Lou Nagy questioned whether the town should be spending money on non-essential items such as the park, given the town's other needs, such as fixing stormwater problems. "It is a good idea but a waste of public money," Nagy said. I would not even say it is a good idea. Dogs do bite, and they can fight ... What about potential liabilities? If dogs want to be unleashed, what happened to fencing in one's yard? -- Oh, NO -- can't let Poochie poop up our professionally pampered lawns, can we? A New Hartford theme is appearing? This looks like the Town's well connected elite class taking care of their own personal needs at all taxpayers' expense. Nonsense - Meanwhile, in Utica, the Kernan Kids are having a Fun Day . . . literally, an all-day carnival in the middle of exam week. Again, there is a lack of attending to the task of learning, and encouraging distractions from learning. I feel especially sorry for the kids who still have exams, and have now had a study day taken from them. Again, it's Kernan School we hear about. The fact that the goings on at Kernan are NOT viewed by the Board of Education as an embarrassment should tell Uticans all they need to know about the folks they have put in charge. Something Bothersome Here . . . Yesterday, the U.S. Department of the Interior ruled that the 1993 compact between the State of New York and the Oneida Indian Nation -- the compact that allows gambling at the Casino -- was valid. I may draw flack for this, but I cannot say that this is a problem. In spite of all the issues regarding unfair competition, taxation, etc., no one can deny that Turning Stone is probably the best thing that has happened to Oneida County in years, in terms of job creation and improvement in our quality of life. None of this would have happened but for the 1993 compact. Yet there is something bothersome about what just happened: A federal administrative agency just trumped the rulings of New York State courts on issues of what New York State officials could and could not do. Somehow I think our Founding Fathers are rolling over in their graves. Pushing Us Over the EDGE . . .
Oneida County officials had been telling us (and advertising to the world) for years that we had a "shovel-ready" chip-fab site in Marcy ... A few days ago, EDGE was crying the blues that the NYRI power line, if it goes on its planned route, would bisect the site, rendering it useless. The public found out only in February that a missing federal wetlands permit was one reason for Oneida County losing the AMD Chip Fab plant to Luther Forest Tech Park near Saratoga. This blogger reminded you that EDGE knew back in 2002 that it needed this permit, but it put its application on a shelf, not considering the lack of a permit an obstacle to marketing. Anyone even remotely familiar with environmental permitting knows that it takes months, at a minimum, to obtain a permit once an application is complete, thus making false Oneida County's advertising of having a "shovel ready site." Did EDGE know this, but forget, demonstrating incompetence? Did EDGE not know this, and not bother to lift a finger to find out, demonstrating laziness? Or did EDGE put the application on the shelf to deliberately scuttle Marcy's chances, to assist certain politicians in playing their Albany game? We'll never know. Today buried in the OD business section EDGE now tells us that they need TWENTY MILLION DOLLARS in infrastructure improvements at the site ... a site that was supposedly "shovel ready" (except for a permit). Just where is this money going to come from? Oneida County residents are all tapped out. Shovel Ready ? . . . My Patoot! Did they keep this $20 mil need a secret from us all these years? Or is this just a ruse -- trying to make the loss of the Chip Fab site to a power line more palatable. (Some people will no doubt think, "no big deal, we'll save $20 mil"). Can you really believe anything you hear from EDGE? More blather appears on today's editorial page pushing the Varick Street closure. As I commented a few days ago, improvements to the street scape make sense -- but closing the (now only 1/2) block between Edward and Court does not. Do the promoters of this plan really know what they are doing? Conspicuously absent from the discussion are traffic counts, trip destination information and surveys of people who use the portion of Varick Street that will be closed. Anecdotally many people coming from the West to go Downtown cut over Varick to avoid the Court Street-Arterial intersection. One can imagine this small change significantly increasing the traffic at the Court-Arterial intersection, thereby justifying the Arterial Overpass at that location that suddenly seemed to have appeared out of nowhere on both the "Depressed Highway" and "Boulevard" alternatives for the proposed Arterial remake -- an overpass that many who live and work in West Utica find objectionable. Without knowing what we are doing, we may wind up actually killing the businesses on Varick, and at the Finish Line on Court, and create a need for an overpass that will isolate this neighborhood completely. One has to ask, how can the powers-that-be come up with a plan to close a street without actually studying traffic impacts? ... And Why? Crumbling Consensus Reveals . . . Conspiracy? After watching these it is clear that the "consensus" of scientists that global warming is man-created is not really a consensus at all, but wishful thinking by controlling politicians. "Real" scientists certainly would NOT declare that the "debate is over," because their endeavor is to uncover the "truth," whatever it may be. Theories should be constantly tested against known facts -- ALL the known facts and not just the ones that tend to support one's pet theory. If a fact does not seem to fit, then there is something that may not be understood and more research is required. That is how science is supposed to work. But when it comes to global warming, it has not. Inconvenient truths such as the facts that CO2 increases LAG behind temperature changes in ice core data, that a Little Ice Age came and went without human intervention, that glaciers were receding before mass industrialization, that farming was once possible in Greenland but not now, and other facts that do not neatly fit the theory are simply ignored rather than reconciled. People who are skeptical of the global warming theory are called names such as "deniers" or "idiots," and their motivations are questioned. These are attempts to marginalize the skeptics -- to get them to be ignored -- and to distract from the facts that they have to present. and on college campuses without the other side being presented -- much less than a debate. In fact, when was the last time you heard a true debate about global warming? I can't think of ever hearing of one -- at least not in the last 10 years. This was not the case a generation ago when "continental drift" was the earth shaking new theory. Facts on both sides of the issue were presented, debate was encouraged, and there was never any name-calling. Of course, continental drift was not the kind of theory that could be used to control the entire world's economy. With all the rhetoric, with all the attempts to marginalize skeptics and stifle debate, with the inculcation going on in schools, one has to wonder: WHY? Ed Hanna running for Mayor of Utica? Leon Koziol running for County Executive? Say what you want about Mr. Hanna -- he didn't always do the right thing -- he sometimes said things that would be embarrassing to Uticans living elsewhere -- he was eccentric -- But the City never looked as good as it did when he was Mayor. Not everyone can be rich, but everyone can be neat and clean, and that is the first step in getting somewhere. The same is true for cities and Mr. Hanna knew it. Mr. Koziol is a mixed bag, too. But he's educated, experienced, and knows the law. Elections this year are shaping up to be very interesting. Finally the voters are getting some choices. The arrogance and recalcitrance of New Hartford and Oneida County officials is simply breathtaking. Knowing full well of the problem with sewage pollution of the Mohawk River, they approved/allowed another sewer hookup for Lowes. All sides seem to be scrambling to look for loopholes -- drawing distinctions between sewer extensions, laterals, and hookups -- in order to allow development to continue. Pretending that there is no problem is always easier than enforcing the law, especially when tax revenue can be gained and conflict with powerful developers can be avoided. Nevertheless, the project exacerbates the pollution problem and government at several levels appears to be allowing it to happen -- sending a clear message that the addition of another duplicative store to the tax base is more important than protecting the environment. New Hartford can't pretend that it was unaware that there were issues here. In December 2005 DEC questioned how liquid waste from the project was to be disposed of, putting New Hartford on notice that waste disposal needed to be examined. 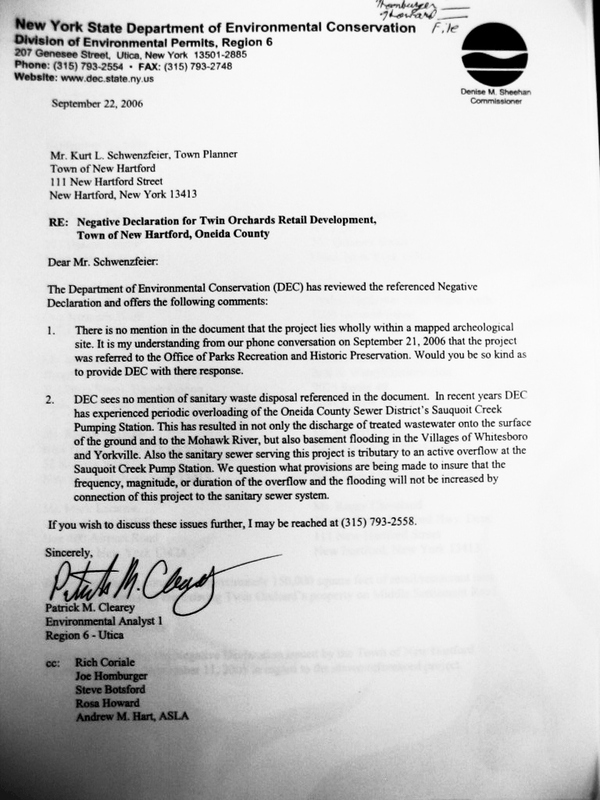 Nevertheless, New Hartford issued a "Negative Declaration" months later, stating that there were no negative environmental impacts to the project. In issuing its Neg Dec, New Hartford simply ignored the sewer overflow problem. 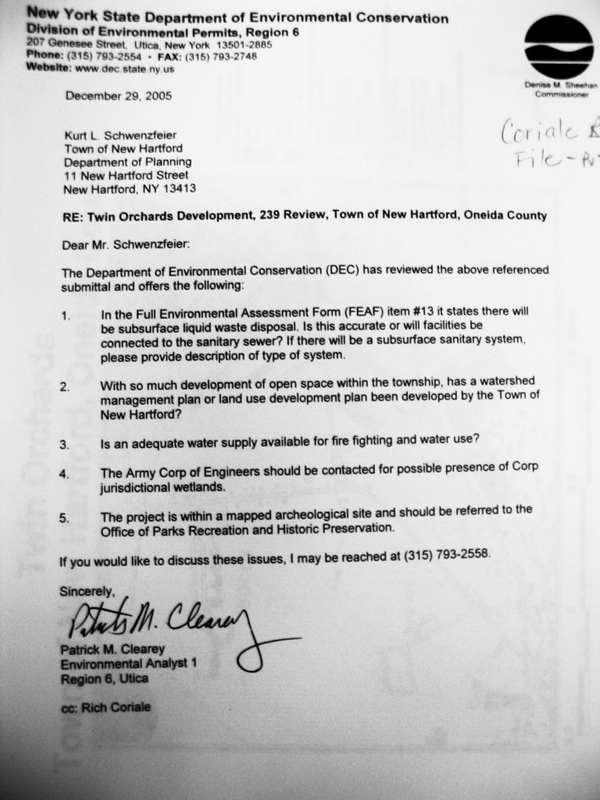 In September 2006 DEC called New Hartford's attention to the inadequacy of its environmental review. But New Hartford's response, apparently, was "dam the torpedoes and full speed ahead." And Oneida County, which should have been an involved agency in this process, simply let its facilities be abused. Simply put, New Hartford's environmental review of this project was defective when it ignored the potential impacts of sewage. That alone should be enough to set aside its Negative Declaration, and, essentially, make void "ab initio" all actions/decisions based upon it, including the issuance of Lowes' building permit. Of course, setting aside the Neg Dec will require someone to go to court. A similar situation in Watertown resulted in the court setting aside a planning board decision. Interestingly, that case involved the same developer that we have here in the Lowes project (COR), with Pyramid Corp. (a competing developer) bringing the action. But isn't it a shame that the public would have to depend on private parties to enforce the law? Clearly, there is a case here to be made. And clearly, the government is in the best position to bring it. The question is, will the government move to protect the public's interest, or will the public be forced to hope that some aggrieved private party will move to protect its interest. It raises the question: Why have government if it does not enforce the law? Varying Varick . . .
Utica is considering creating a pedestrian commons by closing Varick Street between Court and Edward St. It is good that city leaders are thinking of ways to improve city life, particularly on Varick Street which is developing as a center of social activity of sorts. Certainly the creation of off-street parking and wireless internet will enhance the street as a destination. But actually closing Varick Street is a bad idea. While wanting to make Varick Street a destination, city leaders must be careful not to destroy its function as an important traffic artery. If that function is destroyed, it may actually make Varick Street less desirable as a destination because of the complications in getting to, from, and around there. And planting trees in the middle of the closed off portion of Varick Street will create a barrier effect, visually cutting the remainder of the street off from the Finish Line Shops area on the other side of Court Street, essentially dividing the neighborhood into two areas that will be less able to support each other. Pave the entire length of Varick Street (at least from Court to Columbia) with cobblestone (or, to be consistent with Utica's past, brick). That will give the street a different "feel" (literally!) that recalls the past. Where off street parking is being created, eliminate the on-street parking by widening the pedestrian areas and covering them with suitable paving and "furniture" such as park benches, hitching posts, tables. Encourage the use of the widened pedestrian areas as sidewalk cafes during good weather. Of course, landscape with trees, hanging baskets, planter boxes and banners. Varick Street is not the Champs-Élysées , but there is something there to emulate. Paris did not have to close part of the Champs-Élysées to make it a pedestrian magnet. Let's enhance Varick Street without destroying it. Lauding Lawbreaking . . . The OD's editorial department really seems to have gone off the deep end in yesterday's editorial "Fix sewers, but don't ban hookups" which relates to the problem of raw sewage being dumped into the Mohawk River, and the state's response to same. "Who's to blame for what doesn't matter. What matters is that everybody — federal, state and local officials — come together and figure out how to get the problem fixed." There are two problems with this paragraph. First, who's to blame does matter, because consent orders only are required for violations of law. If a public building were to be vandalized, would not the editors want the perpetrators caught, brought to justice, made to provide restitution, and taught a lesson so that the crime is never committed again? What is different here? Are the editors suggesting that the state government should look the other way because local government is the guilty party? Here, the Mohawk River has been vandalized. That is unacceptable, and is a crime under the Environmental Conservation Law Articles 17 and 71. The editors seem to be saying that breaking the law is OK as long as the governmental units or officials that the OD favors do it. Second, it is not the state or federal governments' responsibility to fix a problem that local government has created. This is not some new mandate. The laws have been on the books for 20-30 or more years. State and Federal governments have shelled out perhaps hundreds of millions of dollars (if not more) to aid municipalities -- including Oneida County -- to bring about compliance. Oneida County is in a position to control use of its sewers. It could have banned hookups long ago pending funding and expansion of facilities by municipalities that would benefit from new development. It chose not to. Instead, it looked the other way, rubber stamping local development plans. Why are the taxpayers paying for a County Planning Department if it cannot foresee the cumulative impacts of local projects? The editors are encouraging recklessness, irresponsibility and incompetence by local government when they say that state and federal governments must participate in the solution. The State and Federal governments have already done their part and have no responsibility to do more other than to enforce the law. Yes, this area is economically in the dumper, and the State's actions to enforce laws or agreements may exacerbate the problem. There seems to be an attitude prevailing among some local officials that any infraction, any abuse, whether it be of the law, an agreement, taxpayers or rate payers, should be excused in the name of economic development. The OD appears to have adopted their position. But there is no excuse. In an era when respect for the law has waned, the OD's position is irresponsible. Herkimer County's legislature has finally realized that its long term future is in jeopardy if Mrs. Destito's proposed legislation to give the Mohawk Valley Water Authority unbridled control over 48.5 million gallons per day of Hinckley Lake water is enacted into law. If state legislation gave control of the reservoir's water to the authority, plans for the next 50 years would include enough water to meet Herkimer County's needs, authority Executive Director Patrick Becher and engineers told legislators Wednesday, Becher said. "All of our long-range plans include that entire area," he said. Of course MVWA's plans include Herkimer County. Nothing would satisfy MVWA and its leadership more than to make customers of even more Herkimer County residents. But maybe Herkimer County residents don't want MVWA to be their supplier. Why should they have to deal with MVWA to get their own Herkimer County water, whether it's now, 50 years from now, or later? Mrs. Destito's legislation would sweep all the State protections away, and , essentially, give the MVWA sovereignty over 48.5 MGD of water. This is unprecedented. Herkimer County Legislator Bono wants a written guarantee on the percentage of water Herkimer County would get. While Legislator Bono is well intended, Herkimer County cannot afford to be naive. It was MVWA's breaking of an old agreement that has brought this entire issue to the forefront. Written agreements mean nothing to the MVWA . . . and no one should allow themselves to be blindsided by Mr. Becher's soothing presentations. There is a history of undependability there, and history has a habit of repeating itself. Mrs. Destito's legislation needs to be killed ... now! Let's Celebrate -- Some More . . . Here we go again ... more distractions in the Utica Schools that is ... although what is going on there seems to be prevalent everywhere these days. Now the kids are celebrating "Volunteer Appreciation Day." Sure, let's give a hand to the many volunteers who assist in our schools every day. Let us adults give the hand, that is -- the volunteers are doing our job . . . whether we be parents or teachers. But for the kids to take a day out of their schedule to give accolades to their helpers is nonsense on top of nonsense. There is something very wrong with our schools if they need armies of volunteers to teach basic things such as math and reading. Since volunteers do not necessarily have any special qualifications we should be asking ourselves what are we paying teachers for? Why are the teachers apparently unable to do the job? Funny, this never used to be a problem -- long before there were volunteers in the schools -- long before there were teacher assistants and aides in the schools -- and long before classrooms started looking like menageries. It is nonsense that volunteers are now needed. Now what about the time out of class to "thank" the volunteers? What are the students missing? Seems like there is some new distraction every day -- some new excuse to put away the pen and paper -- to put down the book -- and to party. This sends the wrong message: that doing "politically correct" and "feel-good" things is more important that than the "3 Rs." Let's thank the volunteers -- but also eliminate the reasons why we need them.